This has got to be at the top of my list of favorite supplies! It's inexpensive and comes in so many lovely colors! I'm like a kid in a candy store when it comes to embroidery floss, and I've always been this way. Almost exclusively, I use DMC floss, except for some specialty flosses. DMC has kindly gifted me with many skeins of floss, but that doesn't stop me from buying more of the colors I use all the time. For that, I usually shop locally at JoAnn or Hobby Lobby. There's also a needlework shop near me, which is where I go to find unusual flosses. Oh, and for a real treat, I'm a member of Thread Club (handspun embroidery thread!). 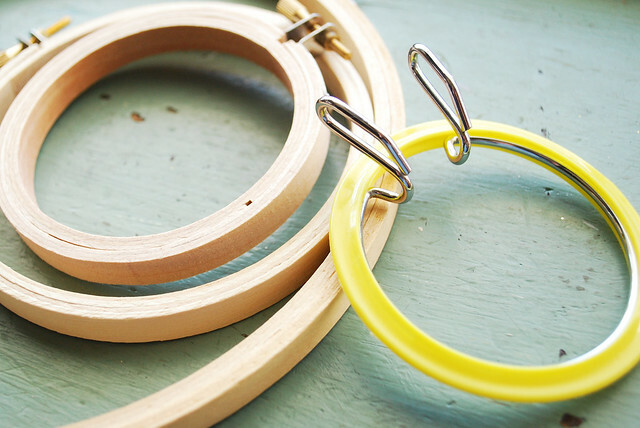 Plain wooden hoops are my favorite to work with, but I also use the teeny spring tension hoop you see here. I should probably own stock in these hoops, because I buy them ALL THE TIME! Usually locally, but sometimes online. Create for Less has a good selection, and I was very happy with the 3" wooden hoops that I ordered from them. They only offer limited international shipping, however. Surprisingly, you'll also find lots of options on Amazon. The vintage hoops that show up on my blog from time to time have all been given to me by family, but there are many to be found on eBay or Etsy. Between my mom and I, we have a decent stash of fabrics, so there are plenty of times that I just grab what I can find for a project. But when it comes to embroidery projects, I have a few that I prefer over others. 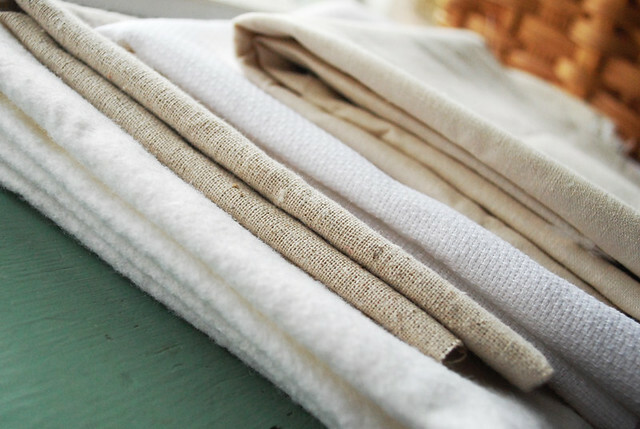 Osnaburg, Weaver's Cloth, Canvas, Muslin and Quilting Cotton are most common for me. I'm trying out a new fabric, which I can't recall the name of (bad blogger! ), but it has a heavier weight to it. I like it, and will share more when I figure out what it is. All of my fabrics like this are purchased locally at JoAnn. I like to walk through and feel the fabrics, looking for what might stitch well. Lots and lots of the projects that I make use felt, but I prefer to work with the wool variety. It's much nicer to work with, and it holds up better too. My local JoAnn has a small selection of wool blend felt by the yard, and I try to work with the colors they have when I can. Most are about 30% wool. It costs a lot less, and is easy for me to purchase without planning too far ahead! Giant Dwarf sells wool blend felt pieces in the loveliest colors. I really want to place a great big order, but am trying to work through what I already have a bit first! I'm not gonna lie, if you've only ever purchased synthetic felt, the price tag on 100% wool may shock you. But believe me...there's a difference in these supplies. A HUGE difference! 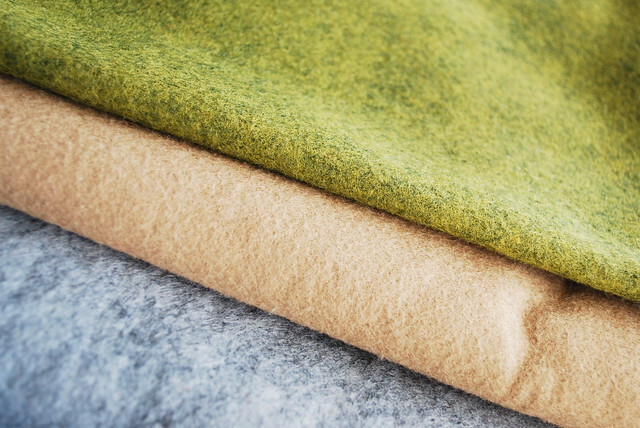 100% wool felt is softer, sturdier, and just plain beautiful. I hang onto every little piece, and do my best to avoid waste. It's a treasure to me! My sheets of felt came from Magic Cabin, but you can find it other places. 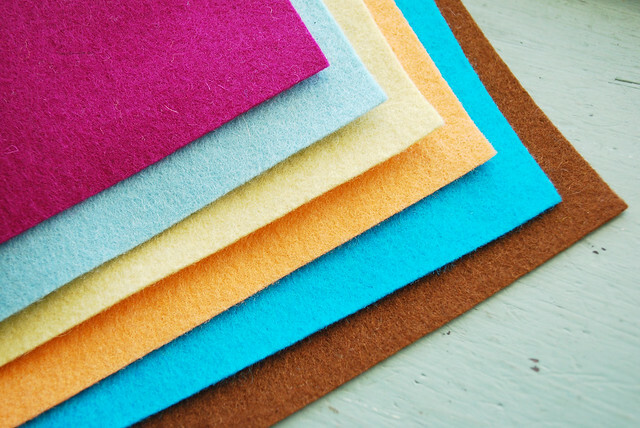 Etsy is a good place to start...just be sure to search for 100% wool felt. I've not ordered from them yet, but Material Evidence has a a huge collection. Those are my favorite supplies and materials, but if there's something you've seen me use, and you want to know more...leave a comment, and I'll reply with an answer! I am in absolute LOVE with 100% wool felt. I've ordered from Material Evidence multiple times and I really enjoy working with them. In fact, I only use them when I'm buying felt supplies for my shop. They are totally great. Just wondering what your recommendation for metallic thread is? I love the look of some shiny thread in some designs - but the one I have is a total nightmare to use! 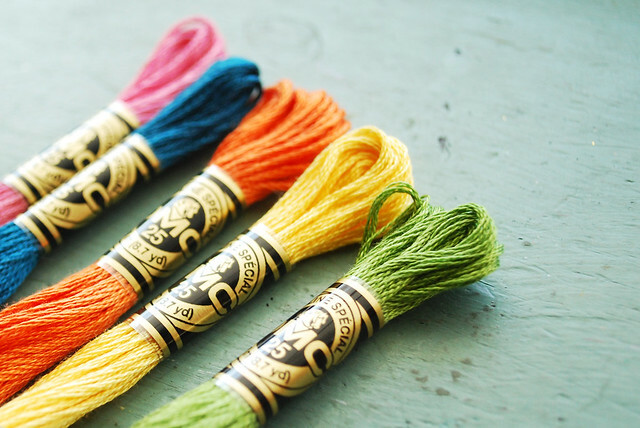 I use DMC's metallic thread, although I know that many really hate it. The trick is to thread it as DMC recommends (see "how to use": http://www.dmc-usa.com/Products/Needlework-Threads/Embroidery-Threads/Light-Effects.aspx), use short pieces, and if all else fails, Thread Heaven does wonders! Thank you so much for this post! Now I have to go and take a look at what Designers Desk has to offer. Apparently we live in the same area! I must take a trip there soon. I vastly prefer spring tension hoops, but can never find them in the stores anymore. THANK YOU for letting me know what they're actually called, and giving a source for them! I only call them 'embroidery hoops' and when I search for that, I just get the other kind. I've been despairing that they're no longer made. I'm so happy to be wrong! Thanks!